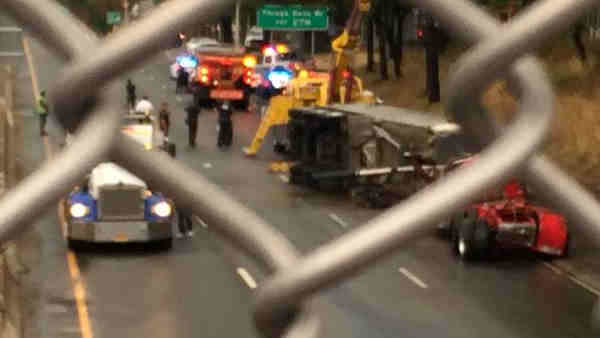 QUEENS, N.Y. (WABC) -- An overturned tractor-trailer has closed the westbound side of the Long Island Expressway in Queens for two hours, backing up traffic into Nassau County. The driver was not seriously hurt, but it took rescuers nearly an hour to extricate him from the vehicle, which flipped at around 5:15 a.m. at Oceana Street in Queens. The driver was taken to New York Hospital Center Queens with non-life threatening injuries. Moving the overturned tractor-trailer has been an extended operation, with a crane and duty tow truck. All lanes reopened a little after 8 a.m. Thursday. The closure backed up westbound traffic for some 10 miles into Nassau County.